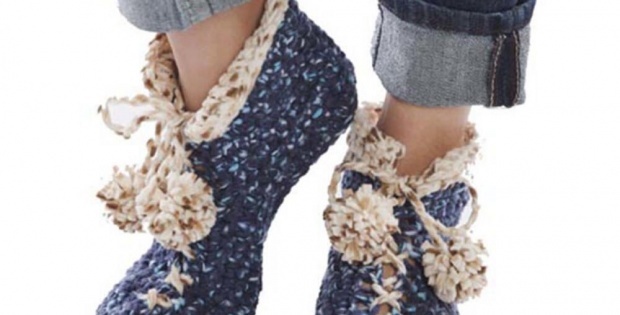 These great crochet cozy cuddle feet slippers will keep feet and toes warm and cozy. The slippers are also wonderful gifts for friends and family. This crochet pattern has been rated as intermediate. It has been written with instructions for two different feet sizes. The instructions are for a sole length of 7 inches as well as 9 inches. In metric measurements, the finished slippers should fit feet sizes that have a sole length of 17.8 cm and 22.9 cm. Furthermore, the pattern for these lovely and cozy crocheted slippers can be downloaded from Premier Yarns. To access the free download for these great slippers with pom poms, please click here: Cozy Cuddle Feet Pattern.